Let’s face it: most UAE residents have to keep the AC on constantly during the summer months, especially when their kids are spending the summer vacation at home. As a result, you are likely to face very high electricity bills if you don’t take steps to conserve energy. This guide by ServiceMarket, the UAE’s leading online marketplace for AC maintenance and repair services, can help you cut down your electricity bills significantly. 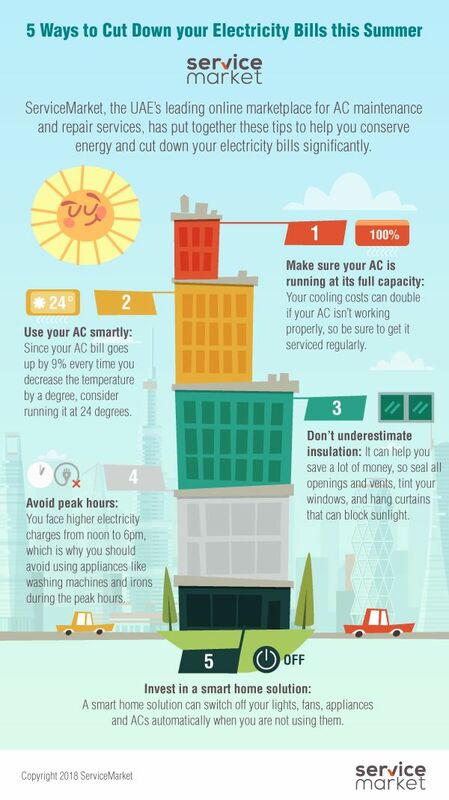 Your cooling costs can double if your AC isn’t working properly. Clogged AC units have to work harder and use more electricity to keep your room cool. To improve the performance of your AC units, get them serviced regularly by a professional AC maintenance company in Dubai. You should also replace all AC units that are more than 10 years old as they are likely to be worn down. It just costs AED 179 to get an AC unit inspected and cleaned. Booking an AC service is now hassle-free on sites like ServiceMarket.com where you can book it online with a click. Did you know that your AC bill goes up by 9% every time you decrease the temperature of your AC system by a degree? It’s recommended that you run your AC at 24 degrees or higher. Consider keeping your ceiling fan on to circulate the air so that you feel comfortable even when you’re using your AC at a higher thermostat setting. Ceiling fans use around the same amount of energy as a light bulb. You’d be surprised by how much money you can save every month if you insulate your air conditioned rooms properly. Your AC has to do a lot of extra work when cool air can escape and hot air can enter your room. So ask your handyman to make sure all openings and vents are closed. Another great way to insulate your rooms is to tint your windows and hang the right types of curtains. Choose curtains with a thick fabric because they are better at blocking sunlight. You should consider blackout curtains for East and West facing windows because they can even block infrared light. You face higher electricity charges from noon to 6pm, which are the peak hours in Dubai. Appliances that use a lot of energy, e.g., washing machines, dishwashers, electric ovens and irons, should be used before and after the peak hours to reduce electricity costs. If you need to run some errands, consider going out from 12pm to 6pm to minimize the amount of energy your AC uses during the peak hours. It goes without saying that you should keep your lights, ACs and fans off when they are not in use or you’re not in the room. You should also unplug your electronic devices when you’re not using them because they can consume electricity in standby mode. Since we often forget to switch off lights, fans, appliances and ACs, consider investing in a smart home solution which can automatically switch them off when you are not using them. Such smart home solutions can also switch off lights outside your house as soon as there is enough sunlight in the morning. If you need help with insulating your home or require a professional AC maintenance company in Dubai to inspect and clean all of your AC units, you can easily find and book a suitable service through ServiceMarket. ServiceMarket only features vetted maintenance and handyman companies and allows you to read reviews and compare quotes to make an informed decision. Looking for an AC maintenance service?